Dramatic & Distinctive. Acucraft custom gas commercial circular fireplaces become the focal point of your space, providing extraordinary style and modern elegance. All Acucraft circular fireplaces are custom made for you to fit your exact needs. Whether you’re looking for a circular commercial fireplace that has a 25″ diameter to accent your space, or a mammoth 96″ diameter fireplace with double burners to be the focal point of your room, we’ll bring your design to life. 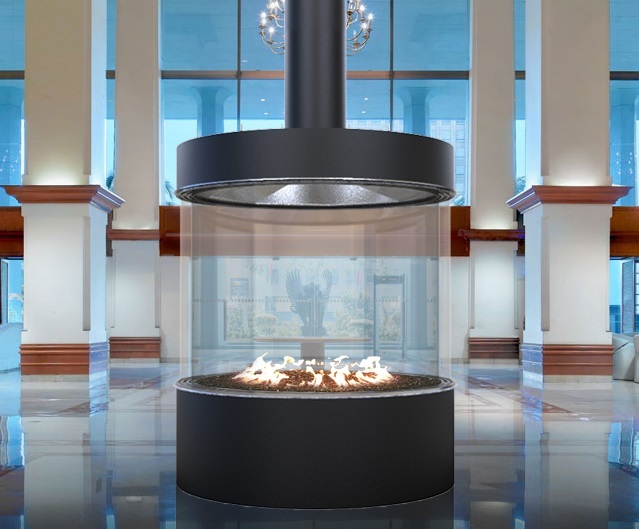 Our circular custom gas commercial fireplaces feature a 360 degree wrap-around unobstructed viewing area that can be enjoyed from any angle! Or, if you’d prefer to finish your custom gas circular fireplace in stone, rock, or another material we offer the option of purchasing just the fireplace and the frame. All Acucraft custom gas fireplaces are made with the highest quality materials. Then they are internally performance and safety tested to meet or exceed ANSI standards before they are crated and delivered to your job site or residence.